Four military strike aircraft fighter jets maneuvering. 118 clips, 1.62 gigabytes. More than 70 fairground sound clips in over 7 gigabytes of audio. Includes crowd, game, and ride sound effects from midways & fun fairs. 41 modern jet fighter maneuvers: whipping passes, fiery climbs, and crackling dive bombs. 241 fresh high-charged motorsports sound effects in 4.87 gigabytes from 9 race types. 250 professional & consumer shop tools: from saws, hammers, & drills to pneumatic & power tools, & more. A toolbox of whistling beeps, cyber blips, and buzzer accents. 500 clips, 513 megabytes. An aggressive fx library packed with 400+ sound design impacts, hits, rises, & releases in ~2 GB of audio. A beefy toolbox of 375 fire, storm, electric, & other whooshes in logos, bursts, blasts, & whip bys. 632 MB. A mix of 425 textured whooshes: subsonic, storm, energy, chattering, fire & others in 1.5 GB. 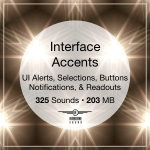 325 designed multimedia UI accents including alerts, buttons, readouts, notifications, selections, & more. 115 loop-ready drones that flow between sinister tones and uplifting atmospheres. 6.49 gigabytes. 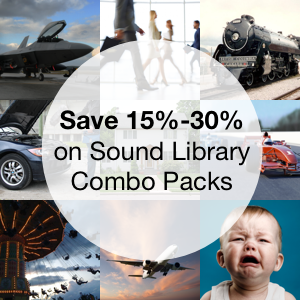 Learn more about the Bargain Bundle sound libraries. A collection of 50 button and switch sound effects. Designed for multimedia projects. This collection of 80 high-definition sound fx contains snow impacts, hits, pushing, crushing, and more. A collection of 70 multimedia whoosh, swipe, sweep, and fly-in sound effects. 39 rare Royal Hudson steam train sound fx in 280 MB. Features engine riding, rail clatters, passes, and more. Learn more about the Elements sound libraries. Over 500 glass breaks, bursts, impacts, debris and scraping sound effects in almost 600 megabytes. Learn more about the Library Builder Vehicle Bundle collections. 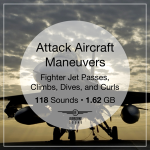 Almost 3 gigs of aviation sounds in 60 effects: helicopter, jet, seaplane, and prop plane sound clips. 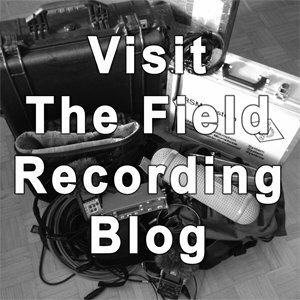 A 500-sound clip collection of car sound effects: passes, idles, riding, and interior Foley. A collection of passenger and commuter trains. 57 takes of interior and exterior locomotives and cars. A collection of 230 transit train sound clips: subway, monorail, streetcar maneuvers and more. Learn more about the Library Builder Bundle collections. 400 household sound clips including alarms, appliances, doors, radios, room tones and more. 400 human sound clips: babies to burps, coughs to screams, laughs, moans, whistles, vomit, voices, more. 155 kitchen sound clips in one 1.35 GB package. Includes cooking, chopping, cleaning, appliances, and more. 3.14 gigabytes in 325 office sound clips. Includes computers, hard drives, phones, and office and desk tools, and others. Learn more about the Library Builder Mixed Library collections. A mix of 50 specific clips and 50 atmospheres. 100 sound fx in over 4.3 gigabytes. Cheers, crowds, more. 50 long atmospheres. 50 focused clips. 4.2 GB of specific & ambient clips. Tech, construction, and more. 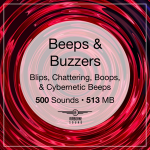 A starter set of 150 sound effects, from a baby's babble to a beer belch, blaring horn bys and beyond in 1.9 GB. 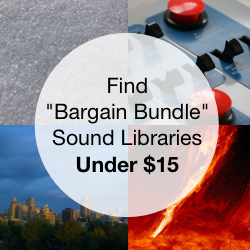 A bundle of 150 mixed household, ambient, vehicle, human, and construction sound fx, and much more. Over 2 gigabytes.